We are pleased you wish to create a course at Great Photography Courses. Our mission is to sell eCourses, which we describe as eBooks with videos, or a courses that consist entirely of all video. Many photographers might be missing some markets by just offering eBooks. Having taught online for 10 years, I have heard many times from students who tell me they learn better in courses that include text with video to emphasize points. I personally began adding videos years ago to my courses and it was very effective. The amount of testimonials students sent when evaluating my courses jumped dramatically. With the rapidly changing technologies for teaching, content that is interactive are selling better. While eBooks can be lucrative, they are static! They can be passed around, have a low perceived value, cannot be updated once sold, AND are not interactive. While they can be profitable, they are not the solution for every buyer. If you are writing eBooks, a companion eCourse means more money for a little more work. Here are a few suggestions and steps to create and setup your course. We believe there is a market for just about any subject in photography and video and what will make your course successful is how you differentiate your course from others. As an example, some location workshops are more popular than others and it is often due to the instructor. Pick a subject you know well. It can be a basic digital photography course, how the camera works, macro, flowers, food, industrial, or a complex scientific high speed flash course. The course can be geared to amateurs or pros, or somewhere in the middle: advanced I guess. A course can be comprised in any format you wish. We recommend a course contain written lessons with videos inserted at specific points, but ultimately it is up to you. More on how to do that shortly. 2) A bio and picture of you: You need a bio describing your fabulous career and/or accomplishments including books, client list, and anything else that clearly establishes you as a professional teaching a great class. We also need a head shot. If you would like to create a short video intro for the sales page this is another great selling tool. 3) For some instructors video is a roadblock, but it sure does not need to be. If you look at my course on flash: http://greatphotographycourses.net/mastering-flash-photography/ I created this sales video in my garage and it is NOT a top tier production. I wanted to make the best-selling tool I could with my $250 Canon HD camcorder and limited video production ability. But you should also know that you DO NOT have to be in front of the camera! Screen recording software is another great option for creating sales videos. You can narrate a slide show on screen talking about your course, or if you prefer not to do that, you can use cheap slide show software, add music and text slides that say what the course is about and not speak a word. Many, many options to make your course have a more interactive feeling. 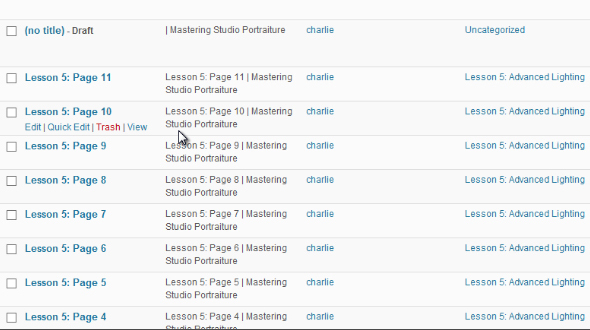 4) And the course files! There are many ways to get all the needed ingredients to create an effective course. No matter what you photograph, consider shooting production stills or video clips of your photo shoots. I have a Nikon 5100 point-and-shoot in my camera bag (now my iPhone) and when setting up to do a shoot I make a quick pass of the scene and capture short video clips to show where my lights are placed. I also shoot stills for the same purpose in case those might be better. I also do not throw away any test shots in digital capture so I can include these in a course showing the progression of a photo as things like lighting or composition are adjusted. Showing before and after is crucial to a successful learning experience. Below is a three image composite of various production stills captured prior to photographing a company CEO. The below video was captured by my wife while photographing cowboys. I had my wife pan back and forth with the point and shoot to show the setup, where the lights were placed, and how I worked with the subjects. Also notice that the audio is random and not narrated because this is B roll where I will add audio later when I edit this to use. And while you watch notice that I had the random audio, then it went silent and then faded back in. All done easily in Windows Live Movie Maker (in case you don’t know video yet). An effective course is a progressive series of lectures that allow the student to reach the course goals. When developing a course it is always helpful to create a summary of what the course will be about. What are the objectives? Who’s the audience? What level is this course? Next create a summary. How many lessons? What will each lesson cover? What points will be included in each lesson? Remember, you can have as many lessons as you wish. Once the chapters and summary are complete, begin to compile a shot list of photos for each lesson; images you have as well as images you need to capture. If you plan to write and include videos you might find it easier to start writing the lessons before deciding where a video will be beneficial, if one is needed to emphasize a point. By now you have heard me emphasize that video will help sell your course and provide a better learning experience for the student. It is true! A simple search of other sites will show you that video is valuable tool to online learning. But it does not mean you have to master video production or editing, but there are a few crucial requirements. Without a doubt the main complaint by students is poor audio. If they cannot hear the audio or it is scratchy or a pitchy sounds or the volume is too low, they might ask for a refund. But this does mean that you need a sound studio either. If you are shooting on location you get what you get, but in the office you do need a quiet area when you record screen videos. I record in my home office and even in my RV without too much problem. Another thought if you think about videos you watch on TV or online, there are scenes that are narrated rather than live audio and this is a very acceptable practice. If you do not want or need location audio, then grab the footage and narrate back in the office. This will require a little more editing knowledge but it s not that difficult. I use a Windows machine and I can tell you that the 3.5mm jack for a headset can be faulty on some machines and fail. There’s a bug somewhere, at least on many machines. I can also attest to the fact that I have bought numerous headsets and other microphones that use that jack and they all sound pitchy. Then I found the Meteor Mic from Samson on Amazon and this is a USB mic and it sounds great! Under $100 and well worth not having to fix audio. Pay attention to lighting as well. I do not have video lights so when I record myself (rare) I make sure I stand near bright window light and use a fill reflector on my shadow side to keep contrast low. This video illustrates the difference between the built in microphone and high quality external mic. While this is not a professionally produced audio track by any means, it shows how simple it is to improve the quality of your audio for a better student experience. So what type of video should you do? It all boils down to whether you like being in front of the camera or not. I will not hire a video pro so I do it all myself and here is what I have learned. Standing in front of the camera is hard and you need a script so you don’t fumble over words or lose your place. I do this very little and in fact, only for the videos on my sales pages. Those seem more important than my casual approach to lessons, which are mostly screen videos. It can be easier as previously suggested, to get footage on location but not bother with audio unless it is crucial and then do voice over narration back in the office. To write a script I prefer to narrate since we write different than we talk. A great program is Dragon Naturally Speaking where you just talk into your mic and say what you want to say and it types the spoken text onto the screen. I actually write all my lessons this way by speaking into the mic to minimize typing. I just talk what I want to say. Then I edit the text in the program itself or copy to Word and edit there. Once edited, you can copy the script to one of many free teleprompter software programs found online. Mine sits on an older laptop that’s placed next to my video camera and when I hit go it starts start scrolling and I narrate what I am reading from the script. I do have a cheap external mic on my Canon video camera for better audio when I record myself. So do you need to do that? It really depends on you and your course. If your course is on nature, have someone record you in the field with the iPhone and one of those low cost external mics made for them (or put your HDdSLR on a tripod) and say what you want to say. That would be very realistic as you stand in front of the Tetons describing the next chapter of your course. These are powerful and crucial to a course. If you have purchased a training DVD on Lightroom as an example, it was done with screen recordings. You have many options here from free programs to very sophisticated ones. I use only programs from Techsmith and use them all. There’s Jing (free), SnagIt ($49), Camtasia Studio ($299). They have versions for PC and Mac. Check out their website for more details including how to use them. Another option is slide show software like Pro Show Gold or Pro Show Producer. Gold is the amateur version with great tools and Producer is the pro version and is quite sophisticated. Y0u can build a videos by inserting still images of screens and images form your camera as well, and then narrate each slide individually to build a cohesive training tutorial. There is an advantage in narrating one image at a time in case you stumble on words or say the wrong thing, you can re-narrate or even go back to a previous slide and re-narrate that image. Another option is that if you are not recording the screen and using slide show software instead, use screen captures to grab still images of the screen and do the same as demoed here: grab a further back and then zoom in for another close up similar to the above examples, then you can insert those into your slide show software and when you dissolve between two slides it appears as though you are zooming in. The final lesson video on industrial photography. I edited out my mistakes in case you remember. This video a production video showing for example, where all the lights were placed during the shoot. This video was captured my an assistant and has no narration from the field. This video shows you a budget way to add narration using the most basic software. Here is the video I would put in class for students. Using screen recording software, I basically replaced the original audio with narration. Try to keep your videos around 5 – 15 minutes for several reasons. Students, should they have to leave momentarily, will often finish watching and then catch up later rather than having to start over and find where the streaming left off at. Shorter videos also hold their attention better. I personally will divide a specific topic into 5 minute clips or close to keep interest focused. An intro video to your course can also be the tool that sells the prospect on signing up for your course. This can be as extravagant as you wish, or not. A slide show put to music with text slides might do it or a slide show with voice over by you may work better. Anything that moves them into thinking “I want to know how to do that” will be successful. Is that cool? You can get these FREE at Flixpress.com. Just signup for an account and go to free templates and then when you click on it, it asks you to enter the text you want in the graphic. Then when you are done it emails you a download link. From there you just add the clip to your video lesson and right there, you have increased the quality of your video. I have 60 videos in my courses and they all have these free graphics. If your course uses lighting you might want to use our PSD Lighting Diagram. For my lighting classes I place diagrams in my lessons that show the lighting setups, unless I shot video clips or production stills. If you want a copy of this to use just let me know. I have created a lot of tools in this PSD file such as reflectors, backgrounds, mono lights, flashes, etc. I insert these as still images into the lessons and also into the videos. It is probably better to suggest you look at the million videos on how to edit that are on YouTube. You can learn just about anything. However, if you are good at speaking, you will not need to edit video. Keep in mind that you want your videos to be ‘human’ meaning they don’t have to be perfect. I often laugh and even do light joking if appropriate. You want your videos to be engaging for the students. For editing software you can then easily edit in Windows Live Moviemaker, Quicktime Pro, or iMovie. These programs are very basic and work very well. For output the MP4 format seems to upload easily. WMV files work great as well. MOV and AVI tend to be huge files and are less desirable simply for that reason, but use what you need to. So what should you charge? That’s a good question and an important one. One thing we feel is important to our instructors is that they have the freedom to choose their price points for their courses. When you look at various sites you find a range of pricing for courses. Some might be over priced and some might be underpriced and the best way to know is to test the market. I read that an average price is between $10 and $30 for each hour in a course so your 5 hour course could be listed at $50 to $150. Don’t lose sight of the idea that if you are an online rock star with a massive following you might get the $150 for the course but might also receive 10x more signups at the $50 price point. We are in the world of Groupon and Living Socially where buyers are spurred more than ever by deals that are too cheap to pass up. You should not ignore that trend. You might list your course at $79 and then have a 25% off coupon code on your website. You might later blog a 50% sale and the school itself will run specials as well. A strategy that works well might be to price a course at $49 or $79 and always be promoting 25%, 50% or once in a while, 75% off. It is all about perceived value. You might have a 3 hour course on macro photography that includes great detail in the sales page, an intro video, 50% text and 50% video lectures, an active student forum in the course, and a dozen student testimonials on the sales page and that course outperforms a 6 hour course lacking those elements. Make the student believe they get great value at the price point you set. The following video shows you how to upload the text part of your lessons. Most likely your text will be in a word document or similar and this needs to be converted within the upload screen and we will show you how in the following video. At this time we need to upload your videos to our server and then position them in your lessons at the location you designate within your lesson. So please tell us specifically the video name, lesson number, and page number; where you want the video located. Finally, keep in mind that your subscribers are your customers and the first to purchase future products from you. While you may have placed your course on sale for $10 and received a good response, you might feel that buyers deserve nothing more from you at that low price. 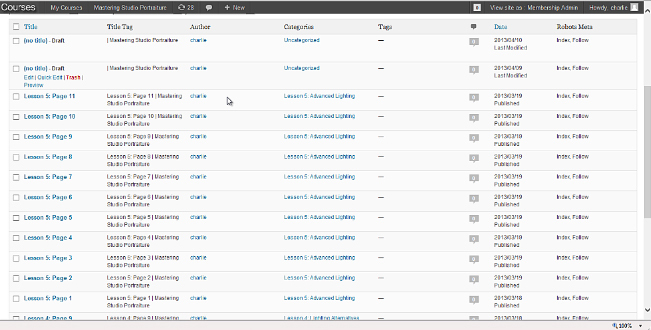 Someone might ask a question for you within the class forums and these are worth taking the time to answer. They are all prospects for the next course you create or a workshop. They are like a flock that should be tended and you already have their attention.